Background : Exsanguinating hemorrhage is the major cause of death in patients with pelvic ring disruption. Aims : The aim of this study was to document outcomes after the stabilization of pelvic ring injuries by a C-clamp and control of hemorrhage by pelvic packing. Physiological parameters were tested as prognostic factors. Setting and Design : This was a retrospective study at a level I trauma center. The study period was from January 1996 to December 2007. Materials and Methods : Fifty patients with pelvic ring disruption and hemorrhagic shock were analyzed. The pelvic rings were fixed by a C-clamp, and patients with ongoing hemorrhage underwent laparotomy and extra- and/or intra-peritoneal pelvic packing. Clinical parameters (heart rate, mean arterial pressure) and physiological parameters (lactate levels, hemoglobin, hematocrit) were documented at admission and at different time points during the initial treatment (1, 2, 3, 4, 6, 8, and 12h after admission). Results : Within 12 h of admission, 16 patients died (nonsurvivors) due to hemorrhagic shock (n=13) or head injuries (n=3). In this group, 12 patients underwent laparotomy with pelvic packing. Thirty-four patients survived the first 12 h (early survivors) after fixation by a C-clamp and additional packing in 23 patients. Four of these patients died 12.3±7.1 days later due to multiple organ failure (n=3) or severe head injury (n=1). The blood lactate level at admission was significantly higher in the group of nonsurvivors (7.2±0.8 mmol/L) compared to the early survivors (4.3±0.5 mmol/L, P<0.05). While hemoglobin values improved within the first 2 h in nonsurvivors, lactate levels continued to increase. Conclusion : Pelvic packing in addition to the C-clamp fixation effectively controls severe hemorrhage in patients with pelvic ring disruption. Early sequential measurements of blood lactate levels can be used to estimate the severity of shock and the response to the shock treatment. The optimal acute treatment of patients with pelvic ring disruption is still under discussion. In order to control hemorrhage, the displaced pelvic ring injury must rapidly be reduced and stabilized by a pelvic binder, an external fixator, or a pelvic clamp. However, additional methods to control hemorrhagic shock are more controversial, and several techniques have been recommended. The use of angiography with arterial embolization has increased during the last decade as a therapeutic alternative to surgery; this technique has mainly been incorporated in management algorithms in the United States. Some reports have noted high angioembolization success rates in carefully selected patient groups. , Several reports have proposed pelvic packing after external fixation; this is performed mainly in European centers. ,, In a previous study, we reported our experience in 14 patients undergoing C-clamp application followed by emergency laparotomy with transabdominal pelvic packing for control of hemorrhagic shock. Immediate posterior pelvic ring stabilization by a C-clamp provided mechanical stability for pelvic tamponade and resulted in an effective control of hemorrhage. The aim of the present study was to investigate the outcome after initial C-clamp application and subsequent laparotomy and extra- and/or intra-peritoneal pelvic packing in a larger cohort of patients with ongoing retro- or pre-peritoneal bleedings. We also analyzed the blood lactate level as a diagnostic parameter for identifying hemorrhage and compared this parameter to the parameters hematocrit and hemoglobin. From January 1, 1996, to December 31, 2007, 50 consecutive polytraumatized patients with pelvic ring disruption were admitted to our level I trauma center. Inclusion criteria were hospital admission within 24 h of injury, an Injury Severity Score (ISS) of ≥17 points, an unstable pelvic ring fracture according to the AO classification (AO B1/2, C1/2/3),  and hemodynamic instability on admission or during any time point of the early resuscitation process. We included patients in whom the dislocation of the pelvic ring had to be reduced and maintained by external fixation using a pelvic C-clamp. Patients with primary definitive osteosynthesis or primary angiographic embolization were excluded. All patients presenting with pelvic ring injuries underwent management according to our institutional protocol for pelvic injuries. The evaluation of the trauma pattern and treatment followed the Advanced Trauma Life Support (ATLS® ) guidelines. Focussed assessment sonography for trauma (FAST) was performed in the emergency room upon arrival. Further assessment included plain radiographs of the chest and pelvis. Concomitant brain, chest, and/or abdominal injuries were evaluated by a CT scan, except for patients with initial severe hemorrhagic shock. In 21 of the 50 patients enrolled in this study, CT scanning could not be performed before emergency treatment due to hemodynamic instability. For early mechanical stabilization of the pelvis, a pelvic binder was applied in the prehospital phase or immediately on arrival. In the case of hemodynamic instability or severe fracture dislocation diagnosed on pelvic X-ray or CT scan, an external pelvic fixation using a pelvic C-clamp was performed in the emergency department or in the operation room. An additional anterior supra-acetabular external fixator was applied in patients with severe disruption of the pubic symphysis and in patients with severe, overlapping pubic rami fractures. In patients with persistent hemodynamic instability due to ongoing hemorrhage, laparotomy and extra- and/or intra- peritoneal packing, or even additional resuscitative thoracotomy, was performed. Associated injuries were treated according to damage control principles. Thereafter, the patient was moved to the intensive care unit, where ongoing core rewarming, correction of coagulopathy, fluid resuscitation, and optimization of the hemodynamic status were carried out. The removal of pelvic or abdominal packing was undertaken within 24 h after trauma or if ongoing or recurrent bleeding was suspected. Data collected retrospectively included patient demographic information, cause of injury, pelvic fracture pattern, injury severity using the abbreviated injury scale (AIS) score for each anatomic region and the ISS. The severity of hemorrhagic shock at admission was defined according to ATLS® guidelines. The number of packed red blood cells (PRBC), fresh frozen plasma (FFP), and platelet units transfused was abstracted. Clinical, physiological, and laboratory parameters [HR, mean arterial pressure (MAP), lactate level, hemoglobin, and hematocrit] at admission and at various time points during initial treatment (1, 2, 3, 4, 6, 8, and 12 h after admission) were recorded. Patients who survived for at least 12 h after admission were categorized as early survivors, whereas those who died within 12 h of admission were termed nonsurvivors. The groups were compared using the Mann-Whitney test for continuous variables. Continuous data were reported as the mean±standard error of the mean (SEM). Differences were considered significant for P<0.05. All statistical analyses were performed using the SPSS software package (SPSS 12.0; SPSS Inc., Chicago, IL, USA). The study included 26 men and 24 women. The average age of the 50 patients enrolled in this study was 44.7±2.6 years with an ISS of 41.7±1.6 points and an Acute physiology and chronic health evaluation (APACHE) II Score of 21.6±1.4 points. In 26 patients, the injuries were the results of traffic accidents involving motor vehicles (n=11), motorcycles or bicycles (n=7), and pedestrians (n=8). Sixteen of the accidents resulted from a fall, 10 of which were suicide attempts. Overall, 20 patients died. The highest mortality rate was found for patients suffering traffic accidents [46.2% (n=12)] followed by patients with self-inflicted injuries [40.0% (n=4)]. A total of sixteen patients died within 12 h of admission (nonsurvivors) due to hemorrhagic shock (n=13) or head injuries (n=3). Thirty-four patients survived the first 12 h (early survivors). Four of these patients died 12.3±3.6 days later due to multiple organ failure (MOF; n=3) or severe head injury (n=1). 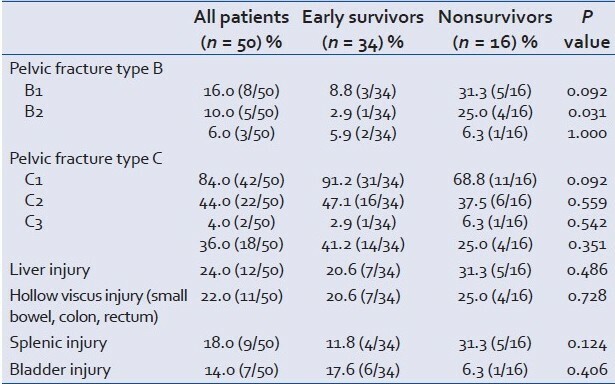 Basic patient demographics and associated injuries for the two study groups are presented in [Table 1]. According to ATLS® , 29 patients showed severe hemorrhagic shock (class III and IV) at admission, and 21 patients were in mild or moderate hemorrhagic shock (class I and II) at admission and deteriorated thereafter. The mean ISS was 43.3±1.9 and 39.8±2.5 for patients in severe and mild/moderate hemorrhagic shock, respectively (P=0.117). 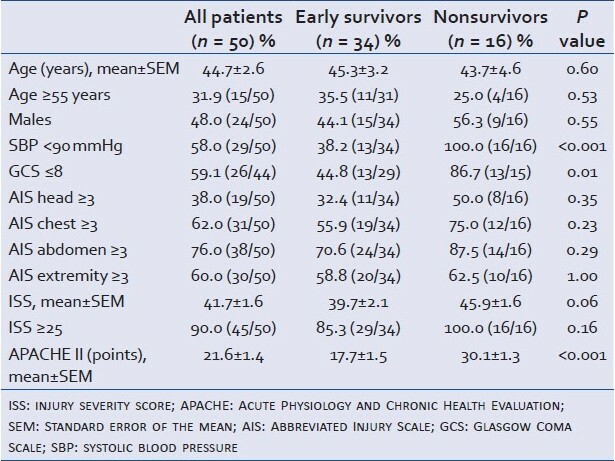 All nonsurvivors initially presented with severe hemorrhagic shock, compared to 13 patients in the early survivor group. Analyses of the pelvic fractures revealed 8 type B and 42 type C fractures according to the AO classification. Associated intra-abdominal or urogenital injuries were found in 32 patients. The organs most commonly injured were the liver (n=12), the hollow viscus (n=11), the spleen (n=9), and the bladder (n=7; [Table 2]). To control hemorrhage, 40 patients underwent laparotomy; 35 of these patients received pelvic packing. In 10 patients, the aorta had to be cross-clamped for hemodynamic stabilization. Additional resuscitative thoracotomy was performed in seven patients in response to absent vital signs [Table 3]. Twenty-two patients required repair of intra-abdominal and/or urogenital organ lesions during emergency operation. In patients undergoing laparotomy, the source of bleeding was venous in 35 cases, whereas arterial bleeding was identified in 5 cases. Additional embolization was not necessary in patients who survived initial treatment with pelvic packing. A detailed description of the blood components transfused within different time frames is provided in [Table 4]. 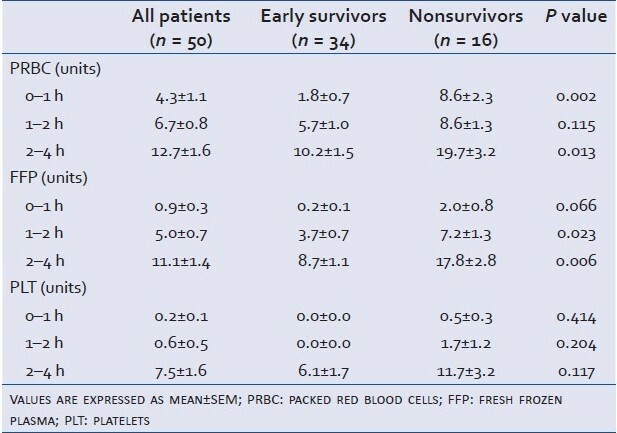 Nonsurvivors received on average 8.6±2.3 units PRBC during the first hour of admission compared with 1.8±0.7 units PRBC in the early survivor group (P=0.002). The C-clamp was applied within 39.5±2.2 min of admission to the hospital. No C-clamp-related complications, such as nerve or vascular damage, perforations, or infections, were observed in clinical follow-up or in the autopsies. Furthermore, no infectious complications related to the pelvic packing occurred. In five patients, an additional anterior supra-acetabular external fixator was applied during the initial operation. The C-clamp was removed 3.3±0.3 days after admission; definitive stabilization of the pelvic ring was performed on day 3.5±0.5. Nonsurvivors had significantly higher HR [Figure 1]a and significantly lower mean arterial pressure (MAP; [Figure 1]b) in the first 6 h after admission. Lactate levels of the nonsurvivors at admission were significantly higher (7.2±0.8 mmol/L) than those in early survivors (4.3±0.5 mmol/L; P<0.05) and continued to increase until death. 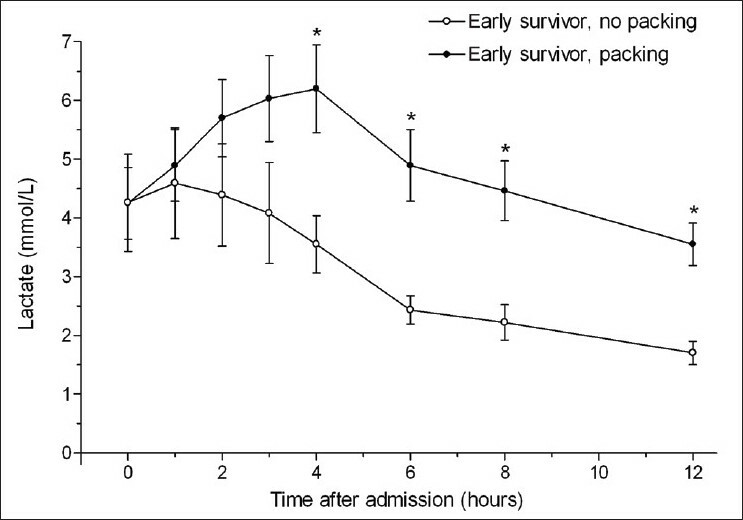 However, lactate levels of early survivors decreased in the 6 h after admission [Figure 2]a. In contrast, hemoglobin [Figure 2]b and hematocrit [Figure 2]c values at admission were significantly lower in the nonsurvivor group, but were similar in both groups 1 h after resuscitation. 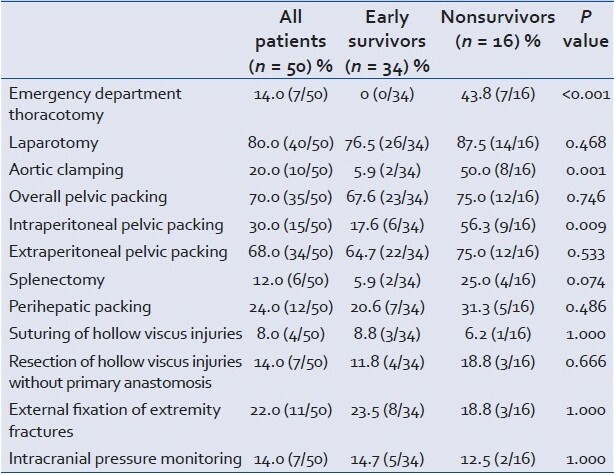 In early survivors, the lactate levels of patients requiring pelvic packing (n=23) due to ongoing hemorrhage were higher than levels of patients without packing (n=11), but decreased within 6 h of admission and normalized (<2 mmol/L) in 19 of the 23 patients within the first 48 h [Figure 3]. Angiographic embolization is used to control posttraumatic intra- and retroperitoneal bleeding. Velmahos et al. reported on 100 patients evaluated by angiography for bleeding from major pelvic fractures or solid visceral organ injuries. In total, 80 patients were embolized due to active contrast extravasation or indirect signs of vascular injury or hemodynamic instability. Angiographic embolization was safe and effective in 95% of these patients. In a study by Agolini et al., of 806 patients admitted with pelvic fractures, 35 underwent pelvic angiography, and 15 (1.9%) required embolization. Bleeding was successfully stopped in all of the embolized patients. However, there are still no studies that report the true frequency of arterial bleeding in unstable pelvic fractures. In addition, angiographic embolization is time consuming, and using this technique hinders simultaneous treatment of other injuries. Thus, in our opinion, angiographic embolization is rarely indicated in patients with unstable pelvic ring fractures and hemodynamic instability. Angiography can be justified only in patients who are hemodynamically stable with arterial bleeding detected by computer tomography or with ongoing hemorrhage after C-clamp application and pelvic packing. External stabilization by C-clamp, combined with pelvic packing, effectively controls hemorrhage; this is especially true when the major source of bleeding is the fracture site or when the bleeding is venous in origin. ,, In a recent retrospective study of 40 hemodynamically unstable patients with pelvic ring fractures, external pelvic fixation in combination with direct retroperitoneal pelvic packing was compared to pelvic angiography. In this series, pelvic packing was as effective as pelvic angiography for hemodynamic stabilization and significantly reduced postprocedure blood transfusion. In an analysis of 28 patients, Tiemann et al. reported their experience using the pelvic C-clamp for emergency treatment of patients with unstable disruption of the posterior pelvic ring. Overall, 7 (25%) patients died. The surviving patients showed blood circulation stabilization as well as consolidation of oxygenation level 6 h after C-clamping. Five hours after the use of the C-clamp, the number of required blood units decreased significantly. However, to avoid damaging the last compartment when opening the retroperitoneum, laparotomy was only performed if blood was confirmed intraperitoneally. In our study, patients with ongoing hemorrhage, as indicated by persistently elevated lactate levels, underwent surgical bleeding control with pelvic packing. Hemorrhage control was achieved about 6 h after admission, which was clear from the decreasing lactate levels in the surviving patients. Furthermore, the intraoperative findings in most of these patients showed severe damage to ligaments of the pelvic ring, damage to the pelvic floor, or damage to the iliopectineal fascia. Self-tamponade of the retroperitoneum cannot be expected in this situation, and a single external fixation might not be sufficient for effective control of bleeding. During primary laparotomy, a high rate of concomitant intra-abdominal injuries was observed; in 14 patients, surgical repair was performed simultaneously. Taken together, these results indicate that hemodynamic instability in unstable pelvic fractures is best treated using a combination of surgical hemostasis by C-clamp and pelvic packing in cases with ongoing bleeding. The early recognition of hemorrhagic shock is fundamental in the management of patients with severe pelvic ring disruption. Hemoglobin and hematocrit have been used in the past for hemorrhage detection and for the estimation of its severity. In our previous work, we demonstrated that hemoglobin and hematocrit are inappropriate parameters for diagnosing shock during the early period after severe pelvic trauma. In contrast, blood lactate levels and kinetics were sensitive parameters for bleeding dynamics and for determining the efficacy of shock therapy. The results of the present study clearly confirm that hemoglobin and hematocrit are unreliable parameters for estimating acute blood loss or for evaluating the response to shock treatment in the early posttraumatic period. While nonsurvivors presented with significantly lower hemoglobin and hematocrit values at admission compared to early survivors, the values were not significantly different after 1 h of resuscitation. Thus, by using hemoglobin or hematocrit during adequate volume replacement, true resuscitation effectiveness may be overestimated, leading to a fatal outcome. However, blood lactate levels and kinetics seem to correlate better with the outcomes of severely injured patients with pelvic fractures. In patients surviving for 12 h after admission, lactate levels decreased after 6 h of shock and surgical treatment, whereas nonsurvivors showed persistently high lactate levels. This confirms that circulating lactate kinetics are the key in rapidly identifying severe hemorrhage and for monitoring the effectiveness of shock treatment. This study has several limitations, the most important being the retrospective nature of the data collection and analysis. Furthermore, as in any long-term study spanning more than a 10-year inclusion period, advances in transfusion practices and critical care medicine may have influenced subsequent outcomes. Pelvic packing in addition to C-clamping effectively controls severe hemorrhage in patients with pelvic ring disruption. Early sequential measurements of blood lactate levels are helpful in estimating the severity of hemorrhagic shock and the response to shock treatment. The authors are indebted to Prof. Dr. Dr. h. c. Otmar Trentz for his commitment, teaching, and support as director of the Division of Trauma Surgery, Department of Surgery, University Hospital Zurich, in recent years. 1. Starr AJ, Griffin DR, Reinert CM, Frawley WH, Walker J, Whitlock SN, et al. Pelvic ring disruptions: Prediction of associated injuries, transfusion requirement, pelvic arteriography, complications, and mortality. J Orthop Trauma 2002;16:553-61. 2. Smith WR, Moore EE, Osborn P, Agudelo JF, Morgan SJ, Parekh AA, et al. Retroperitoneal packing as a resuscitation technique for hemodynamically unstable patients with pelvic fractures: Report of two representative cases and a description of technique. J Trauma 2005;59:1510-4. 3. Biffl WL, Smith WR, Moore EE, Gonzalez RJ, Morgan SJ, Hennessey T, et al. Evolution of a multidisciplinary clinical pathway for the management of unstable patients with pelvic fractures. Ann Surg 2001;233:843-50. 4. Gansslen A, Giannoudis P, Pape HC. Hemorrhage in pelvic fracture: Who needs angiography? Curr Opin Crit Care 2003;9:515-23. 5. Sadri H, Nguyen-Tang T, Stern R, Hoffmeyer P, Peter R. Control of severe hemorrhage using C-clamp and arterial embolization in hemodynamically unstable patients with pelvic ring disruption. Arch Orthop Trauma Surg 2005;125:443-7. 6. Tiemann AH, Boehme J, Josten C. Emergency treatment of multiply injured patients with unstable disruption of the posterior pelvic ring by using the C-clamp. Eur J Trauma 2005;31:244-51. 7. Paladino L, Sinert R, Wallace D, Anderson T, Yadav K, Zehtabchi S. The utility of base deficit and arterial lactate in differentiating major from minor injury in trauma patients with normal vital signs. Resuscitation 2008;77:363-8. 8. Ertel W, Keel M, Eid K, Platz A, Trentz O. Control of severe hemorrhage using C-clamp and pelvic packing in multiply injured patients with pelvic ring disruption. J Orthop Trauma. 2001;15:468-74. 9. Velmahos GC, Toutouzas KG, Vassiliu P, Sarkisyan G, Chan LS, Hanks SH, et al. A prospective study on the safety and efficacy of angiographic embolization for pelvic and visceral injuries. J Trauma 2002;53:303-8. 10. Agolini SF, Shah K, Jaffe J, Newcomb J, Rhodes M, Reed JF 3 rd . Arterial embolization is a rapid and effective technique for controlling pelvic fracture hemorrhage. J Trauma 1997;43:395-9. 11. van Vugt AB, van Kampen A. An unstable pelvic ring. The killing fracture. J Bone Joint Surg Br 2006;88:427-33. 12. Orthopaedic Trauma Association Committee for Coding and Classification. Fracture and dislocation compendium. J Orthop Trauma 1996;10 Suppl 1: v-ix, 1-154. 13. Collicott PE, Hughes I. Training in advanced trauma life support. JAMA 1980;243:1156-9. 14. American College of Surgeons. Hemorrhagic shock classification. Advanced Trauma Life Support for Physicians, Instructor Manual. Chicago. 1993. p.86. 15. Croce MA, Magnotti LJ, Savage SA, Wood GW 2 nd , Fabian TC. Emergent pelvic fixation in patients with exsanguinating pelvic fractures. J Am Coll Surg 2007;204:935-9. 16. Osborn PM, Smith WR, Moore EE, Cothren CC, Morgan SJ, Williams AE, et al. Direct retroperitoneal pelvic packing versus pelvic angiography: A comparison of two management protocols for haemodynamically unstable pelvic fractures. Injury 2009;40:54-60. Lehmann, W. and Hoffmann, M. and Briem, D. and Grossterlinden, L. and Petersen, J.P. and Priemel, M. and Pogoda, P. and Ruecker, A. and Rueger, J.M. Rommens, P.M. and Wagner, D. and Hofmann, A.